Within total beer sales for the year of 2018, imported beer is playing an increasingly large and dynamic role. 2017 saw sales increase considerably for the category, and 2018 saw those numbers continue their upward trend. Dollar sales for the calendar year of 2018 ring in at about $7 billion, which is an increase of roughly $488 million compared to 2017, or more than 7 percent. 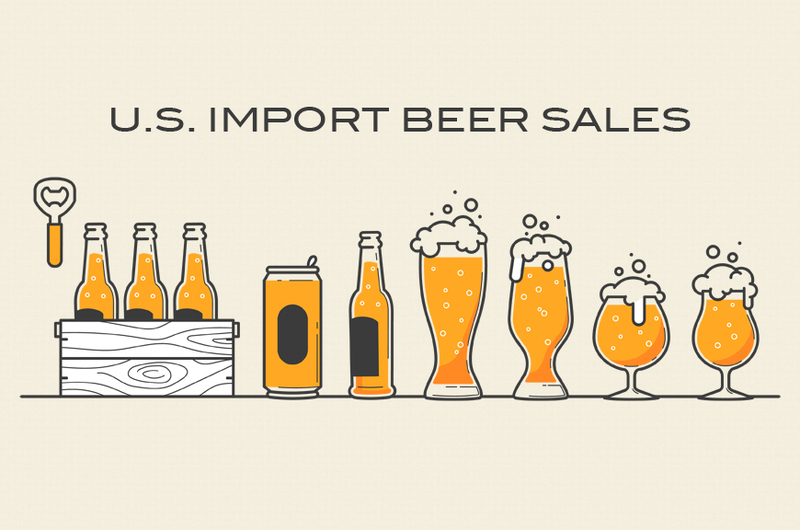 This puts imported beer at almost exactly 20 percent of the entire beer market share, and second to only Domestic Premium (Budweiser, MillerCoors…) in total sales. While the Domestic Premiums still comprise about 36 percent of total market share, sales for that category dropped by over half a billion this past year, which can be interpreted as a one-two punch from Imports and Craft. Imports are a mixed bag of high-margin, lower volume segments like Belgian beer and higher volume, lower price-point powerhouses a la Mexican beer, which combine into an alluring set of new experiences for the drinker that still retain an air of comfort and familiarity. They share similarities with both Craft and Domestic categories, but simply by virtue of being from elsewhere they boast a competitive edge – at least in the current state of the market. While Imports are flourishing, not all its segments are faring equally as well. In the past we have discussed reasons why Mexican beer boasts an intrinsic advantage over its overseas imported counterparts. Proximity is a key factor. As a neighboring country, ease of import and demographic and cultural ties between the U.S. and Mexico facilitate sales, trade and growth. Factor in the easy-drinking nature of lager-dominant Mexican beer, which marries with the American palate as both a stand-alone beverage and a food pairing, and you’ve got a winning combination. Also, while it may be obvious, costs of transportation are lower for Mexican imports that don’t have to cross an entire ocean to reach the American drinker. However, there’s one more factor that is undoubtedly swaying sales. Both Modelo and Corona are top ten beer brands across all categories, and Modelo especially has seen a drastic sales increase in the past year – up $278 million dollars, or almost 20 percent to a whopping $1.76 billion. These numbers have Modelo in line with Corona, but actually surpassing it – Corona rings in at $1.74 billion, and saw growth of .1 percent this year. So what was Corona already doing that Modelo wasn’t? Marketing. Both brands are under the Constellation Brands umbrella, which has done a superb job of advertising Modelo and Corona as lifestyle brands. Television especially has rapidly brought Modelo to a much wider audience. The pockets are deep with these brands, but for any imported brand looking for strong growth, marketing might be the answer. What traits and demographics do your brands identify with? Are they marketable to the masses? If not, it is likely wiser to not overextend, but rather hunker down and focus on a more ground-level approach. It’s hard to imagine esoteric Belgian beer on television, and perhaps it shouldn’t be. It is likely neither feasible or practical. Much of the appeal of traditional brands is their uncompromising “pure” nature. They are meant to be sought out. Therefore, the question becomes – what means of marketing can bring a brand to a wider audience that remain in line with its core values? Before you answer that question, though, here’s one more to consider: Is growth required now, or is it more important to hold fast and weather the cyclical nature of beer sales trends? After all, brands rooted in tradition and history automatically boast a differentiating factor simply by having survived. Pursuing growth is a gamble and, in many ways, a road which you cannot turn back on once you’ve started, both financially and philosophically. For the smaller, artisanal producer – look inward before looking outward, just as you’ve done with the creation of your products. Quality over quantity will never fail. The data we’ve examined comes from IRI Worldwide, a market research firm that tracks category-wide sales trends of beer sold in numerous retail outlets and then produces a monthly report of its findings. These findings can be used to provide real-time insight into the ever-changing beer marketplace, both Craft and Macro. They can also help industry participants adapt to the marketplace and help you make more informed choices as a consumer. These findings can help you make more informed choices as a consumer and can help commercial brewers adapt to the marketplace. Sometimes, it’s just fun to see what’s hot and what’s not. Here are a few things to keep in mind – these numbers are on an national scale and may not represent individual brewery or regional sales accurately. The numbers also do not draw a hard line between beer styles within certain categories, which could mask sales trends of smaller brewers. They track sales of packaged beer only and from a few different sources, including convenience stores (think gas stations), a general “food” category (grocery stores, etc. ), and a combined multi-outlet and convenience (MULC) store category (a combination of grocery, drug, Wal-Mart/Sam’s Club, dollar stores and military stores, among others). We have focused on the MULC category. While not all-encompassing, it’s a great, well-rounded resource.